May Day is strike day, not just another bank holiday! May Day is International workers’ day. People throughout the world celebrate past struggles and economic, social and labour victories such as the eight-hour work day. However this year this cannot be treated like a celebration but like the beginning of a huge struggle against the austerity policies. Many of those gains and rights are now being attacked. Permanent and stable jobs, decent salaries and pensions are being replaced with flexible, part time jobs, 0-hour contracts and low salaries. The government attacks workers, pensioners and unemployed with cuts in jobs, pensions and public services and privatizations for profit whilst the bankers are getting bailed out. The cuts will keep coming and the inequality gap between the rich and poor will keep growing unless workers across Europe and around the world unite to fight back and strike to reclaim their rights. In such critical times of social, political and economic crisis, May Day is an opportunity for united action where all the different struggles, of workers’, pensioners’ students’, women’s, immigrants’ must be brought together. 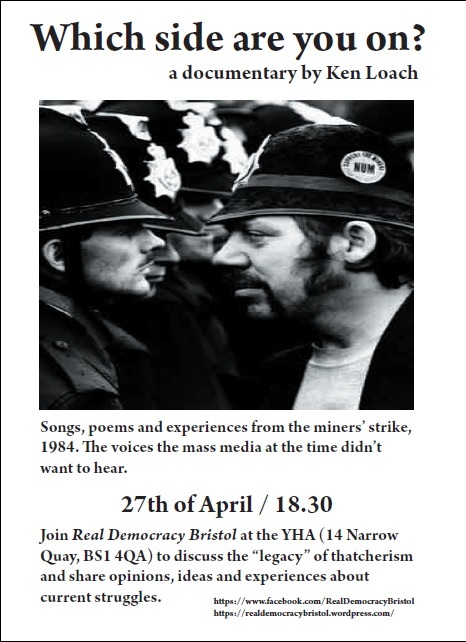 Real democracy Bristol invites all the workers, unemployed, pensioners and youth to participate in the May Day demonstration of the Trades Unions and BaDaCa in College Green at 11.30, 4th May in order to show our opposition to austerity cuts and attacks on workers’ and human rights. May Day Demonstration, Saturday 4th May, 11.00, College Green. Against the austerity and the budget cuts! For a better life! Which side are you on? A documentary by Ken Loach. No more austerity and cuts! Fight for our future! The current global crisis has affected workers, unemployed, students and pensioners all over Europe. The crisis has social, economic and political impacts: firm closures lead to millions of redundancies; more people are living below the poverty line deepening in such a way the gap between rich and poor. Rising poverty and unemployment and the socio-political developments of the last 30 years under neo-liberalism are likely to intensify divisions based on racial or ethnic difference within society and push down the legitimacy of the political institutions. In order to confront the crisis, to restore the profit rate, to service the total debt and to rescue the banks (by huge bailouts) the governments in Europe applied certain policies. The European banks were extremely exposed to the national debts of the periphery. The bailout of the banks by the member states was important since the states switched the holding of sovereign bonds from the European banks to the European tax payers having as their main argument financial discipline and paying off the debt. Especially in the periphery of the European Union the austerity measures and the budget cuts, under the guidelines of the ECB and the IMF deteriorated the situation and deepened the division between the core and periphery. Austerity measures, budget cuts, house evictions pushing down the salaries and the pensions, privatisations, raising the taxation for the poor, inflation and increasing the flexibility of the workers, led to more than 10,000 suicides in the last three years. 11% unemployment in the Euro zone, more than 25% of the people live below the poverty line and thousands of homeless people reflect the situation in Europe. This is the real character of the murderous EU! However, this situation is also visible in the core of the EU transferred due to the characteristics of the EU and the character of the austerity policies. The conservative and liberal government coalition has already applied, in England, the 5 year Government Austerity Program (in order to reduce the national deficit) which aims at destroying the welfare state: huge education cuts and increase of tuition fees, huge cuts in the health and care system (the NHS is under huge attack), companies more interested in avoiding taxation than recruiting new people. That means no new jobs, no income increase and that the gap in society in terms of income is rising dramatically. In addition, in Bristol, the new mayor, the independent neo-liberal Ferguson applies more than 100 million pounds cuts of housing, transport and local care services. On the 13th of March people all over Europe will mobilize against this situation. We should fight united against the austerity measures and paying off the debt in order to reduce inequalities, defend our social and economic rights and achieve social justice. In this struggle the unions should be on the front line by mobilizing the workers with strikes. Against EU policies! Against police repression! Against paying off the debt! Against austerity! For our lives. For our future! People over profits! We will not pay for your crisis! What is really happening in the European Union? The current economic crisis has affected the whole socio-economic situation in the globalised economy. Workers, youth and unemployed people are suffering not only from the impact of the crisis but mainly from the shock doctrine policies that the neoliberal governments decided to apply in order to confront crisis. For them confronting efficiently the crisis means rescuing the banks, restoring the profit rate and attacking on the majority of the society. The situation is much worse in the EU and especially in the eurozone. During crisis the division between the core and the periphery has become deeper and bigger. The policies that were implemented were a mixture of rescuing the banks and the financial institutions and cutting much of the funds intended for the welfare of society. As a result, the unemployment skyrocketed, poverty increased and the living standards deteriorated in the periphery of EU. However, this situation is also visible in the core of the EU. This happens because of the characteristics of the EU (open borders, integrated economy). The European banks were extremely exposed to the national debts of the periphery. The bailout of banks by the MS was important since the states switched the holdings of sovereign bonds from the European banks to the European taxpayers. The main argument of the governments is the financial discipline and the pay off the national debt. The national debt increase stems from the loans borrowed in order to finance large companies, mega events and the international military industry. Especially in the periphery of the EU, the national debt increased much more by the billion of euro spent by governments to bail out the banks and the financial companies that have heavily invested in ‘toxic’ financial products in the virtual financial economy. The global and domestic financial capital (the speculators) saw in the periphery of the EU a great opportunity to make huge loads of money. With the full agreement of the EU, and the directions of the IMF and the European Central Bank huge austerity programs and budget cuts were implemented in the whole of the periphery of the eurozone (Greece, Spain, Portugal, Ireland, Cyprus). For all these reasons a discussion is necessary. People need to talk, exchange opinions, draw conclusions from real evidence, to decide and struggle collectively against this dark future that they plan for us. 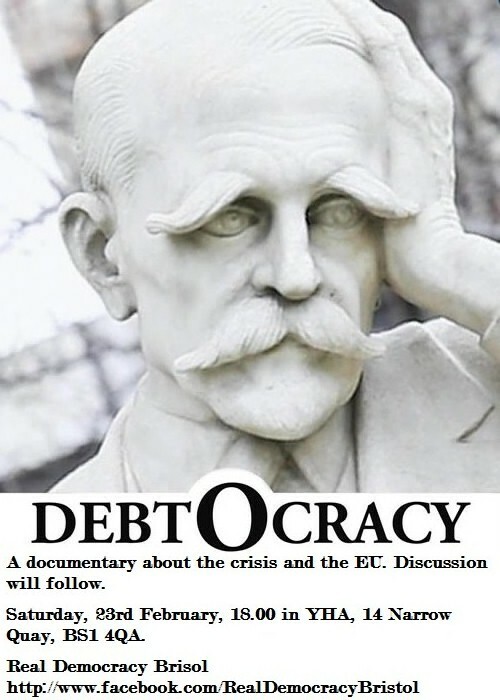 We will show the documentary “Debtocracy” (independent production) that focuses on aspects of the Greek crisis that are not presented in mainstream media. The documentary will be followed by an open discussion on the topic. Come to discuss! Saturday 23rd February 2013, 18.00 at the YHA, 14 Narrow Quay, BS1 4QA, Bristol.